When Alvin Toffler wrote the book “Future Shock” in 1970 he envisioned a world in which people could work from home in “Digital Cottages”. Thirty years later the “Digital Cottage” is giving way to “Digital Roaming” and almost universal WIFI connectivity. I have worked online in the middle of Golden Gate Park and made business calls on the edge of an active volcano in Costa Rica. With a laptop and a telecommunications connection I can and do work from almost anywhere. The web publishing business I run is made up of a team who all work remotely. Most of them have never met each other except online. Yet we collaborate remotely and the company flourishes. The information age is truly upon us. The old boundaries to living and working outside an office or cottage are being removed for thousands of people. I have met many other Digital Vagabonds who have discovered the same freedom. Today there is a new breed of vagabond – the “Digital Vagabond”. The digital vagabond can roam free and yet remain connected. Their world is their playground and work place. In 1970 Alvin Toffler predicted an inevitable ever accelerating pace of change that would cause people to experience “Future Shock”. You know, like the shock of having your hard drive melt down, cell phones that drop off abruptly and software that needs to be version 7.3.4.3.b before it actually works. After millions of years of hunting, gathering, and farming we are suddenly surfers of information, starring at monitors, down loading and uploading abstract data. No longer clubbing and skinning but cutting and pasting. Is this human or natural? Yes, we now live with the insecurity of no longer understanding, let alone controlling, the world we live in. Could this be the price of our advancement? Yet as the Borg are fond of saying “resistance is futile . . . you will be assimilated into the collective” (or corporation if you prefer). But being “plugged in” to the collective doesn’t necessarily mean losing ones independence. And just as Alvin Toffler bemoaned the trauma of “future shock” he also heralded the coming of the “Electronic Cottage” enabling people to work from home. For all its aggravating glitchy complexity, technology can enable one to be interdependent instead of dependent. Instead of shacking us, wireless phones and web access can at least give us freer range if not freedom. With wireless web, remote servers, wireless phones, portable laptops . 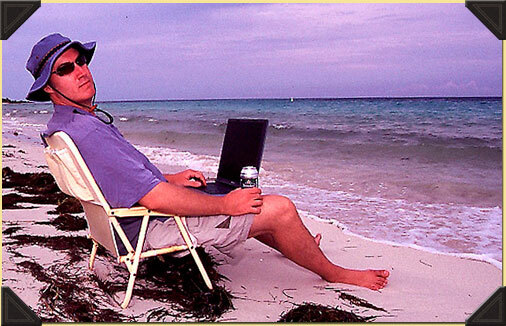 . . why office out of a cottage when you can office out to the world – any time any where. Why be a serf in an “electronic cottage” when one can be a “digital vagabond” with the world for an office and a playground? In the virtual world people and ideas cross paths instantly. The communities we can now be a member of are no longer defined just by where we live and who happens to live next to us. Today we can form communities of common interest that transcend geography, distance and time. The world is over flowing with talent and creative people who want to share their art and themselves. I hope that in time this site will serve as a place where truly creative people and ideas can cross paths both on and offline. My laptop is my rebel out post. My base station for staying connected and yet free from the world. Technology can have an equalizing effect. A one person business can have a Web presence equal to a major corporation. In the information age – knowledge is a power that can even rival capital. Yet even more powerful than pure knowledge is imagination. Or as Albert Einstein said “Imagination is more important than knowledge”. So for those of us who “dare to dream” we can animate knowledge and technology of our times with our imagination. The hard fought for progress that those nerdy rocket scientists bring us is a gift. And those of us who take it and run will leverage its possibilities. So while I bemoan how much I find myself starring at monitors – TV, Video, computer, camera, reading emails . . . ultimately I embrace them. Because as I vagabond the world these monitors open up windows to new worlds, and I am a Digital Vagabond “enabled” by technology and propelled by imagination. Yes, “Imagination is more important than knowledge”. But knowledge animated by imagination is the new currency of our Brave New WiFi World.